This illustrated beginner’s guide to the Bible features essential information on the Old Testament in a straightforward and easy-to-read format. Brush up on the Bible with this full-color guide to the most important ideas and figures of the Old Testament. 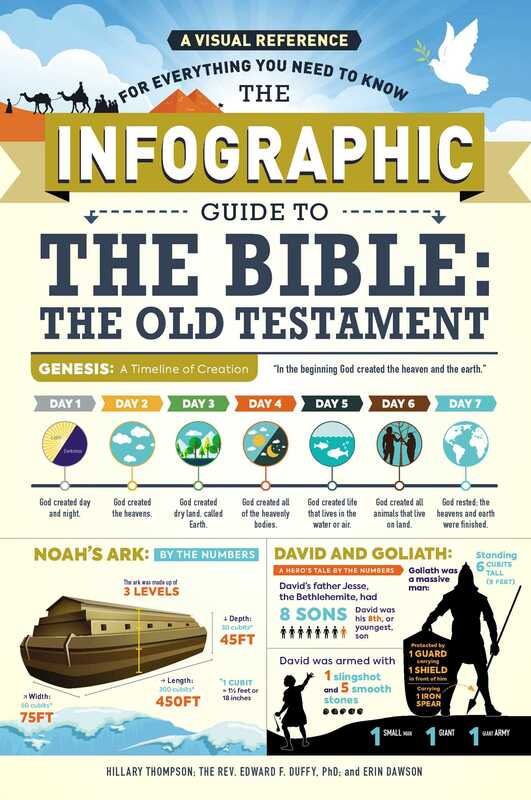 Featuring fully illustrated infographics of key events such as the story of creation, the exodus from Egypt, the wisdom of King Solomon, and much more, The Infographic Guide to the Bible will entertain and educate all readers! "This collection of informational stand-alone graphics depicts major events, people and concepts in the Bible from Noah’s ark and building the walls of Jerusalem to understanding heaven and hell. It’s done in full color and an easy-to-read format that will help Bible study groups of all ages."